Every file and folders are associated with particular users and groups in Linux for security. The permission for every user and group are different and all the files and folders are not accessible by all users and groups. Sometimes we need to change the ownership and group permission for any file or folder from the terminal. This task can be done easily by using the `chown` command. The uses of `chown` command are shown in this tutorial by using different examples. `chown` command can be used with the filename or reference filename. OPTION, OWNER or GROUP are optional for this command. Three types of permissions of three types of users can be assigned for any file or folder. The user types are the user, group and others and permissions are read(r), write(r) and execute(x). -c or –changes Shows the changes in the ownership of the actual file. –reference=FILE Use to change the ownership of any file or folder based on the reference file. -R or –recursive Use to change the ownership of directories recursively. –dereference Act on where the symbolic links point to. -h or –no-dereference Act on symbolic links themselves. -f or –silent or –quiet Error messages will be omitted for those files whose ownership cannot be changed. -v or –verbose Shows the actions taken for every file for chown command. The user must have root privilege to change the user or group ownership of a file and folder. The following `chown` command will change the user ownership to ‘root’ for the text file ‘test.txt’. The user has to use ‘:’ before the group name to change the group ownership of any file and folder. 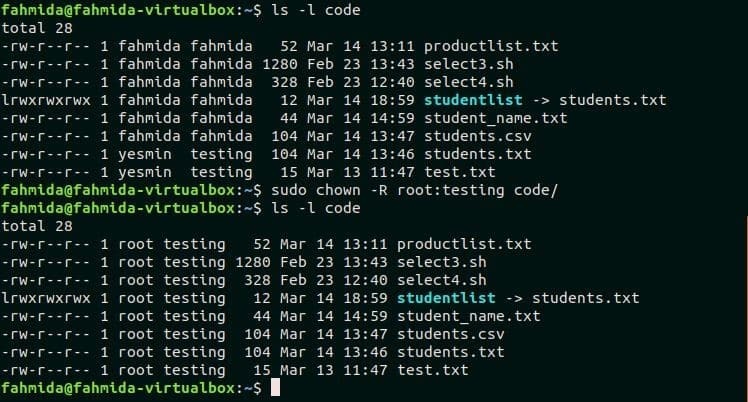 The following `chown` command will change the group ownership of ‘students.txt’ file to the group, ‘testing’. Both user and group ownership can be changed together by using ‘chown` command. 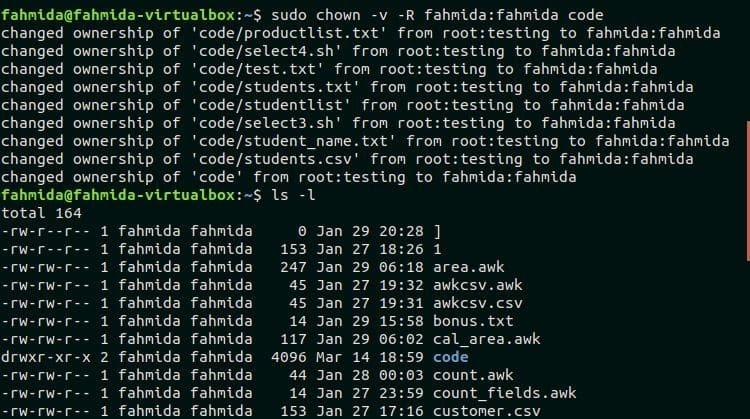 The following ‘chown` command will change the user ownership to ‘fahmida’ and group ownership to ‘testing’ for the file ‘test.txt’. If you want to change the ownership of any file or folder based on the current ownership then you have to use ‘–from’ option with the `chown` command. The first `chown` command in this example will not be able to change the ownership because the current owner is ‘fahmida’ not ‘root’. The second `chown` command will change the user ownership to ‘yesmin’ from ‘fahmida’ for the file ‘test.txt’. By using –reference option ownership of one file or folder can be easily copied to another file and folder. The following `chown` command will copy the user and group ownership of ‘test.txt’ file to ‘students.txt’ file. The following `chown` command with -R option will change the user ownership to ‘root’ and group ownership to ‘testing’ for all the files and folders under ‘code’ folder. The following `chown` command with -v option will show the list of all changes in ownership by executing the command. This tutorial will help the Linux user to know the use of `chown` command and apply the command properly to change the ownership for any file or folder.